The chicken burgers are so juicy and flavourful you will wonder why you don’t make them more often, and the asian greens are so versatile, you can use whatever vegetables you can get your hands on, as the dressing is the real star that will steal the show! Although the list of ingredient may look extensive for both dishes, they really use the same flavour components of ginger, garlic and chilli so you really do not need to buy a lot of extra ingredients at the supermarket. Put all the above ingredients apart from the olive oil in a large bowl and mix thoroughly with your hands and let rest in the fridge for a few minutes. If you cannot find ground chicken, cut up chicken breast and thighs roughly and put all the above ingredients in a food processor and pulse until well combined. Heat up the olive oil in a pan, and in the meantime form your ground chicken mixtures into burgers. I make 6 large burgers. Fry the patties in batches for about 4 minutes on each side or until cooked through. You want to get a nice gold brown colouring on the patties so try not to move them while they are frying. Once the patties are ready, pat them down with a kitchen paper towel and serve with the Asian Greens. First make the dressing. In a small bowl place the ginger, garlic and chilli. Then add the sesame oil, olive oil, soy sauce, the juice of one lime and the balsamic vinegar. Whisk everything together. The flavours take time to develop so let the dressing rest for a few minutes. If you feel that it needs something more this is the time to add it. You are looking for a wonderful balance of salty, sweet and acid. Then fill a large frying pan of water and a pinch of salt and let simmer. Once the water starts to bubble place the asparagus in the frying pan and simmer for 3-6 minutes or until the asparagus is tender. 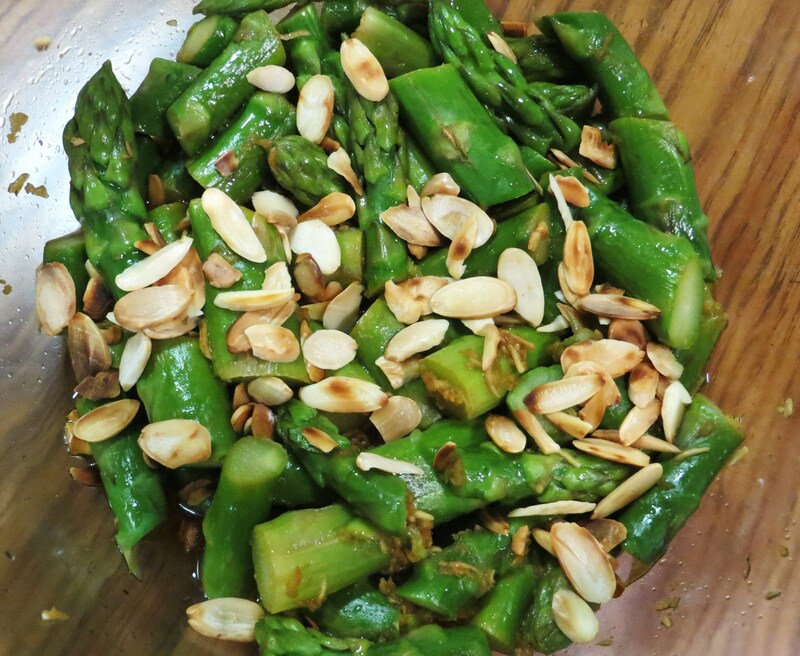 Cut the asparagus into 3 pieces then pop them into the serving bowl. Pour the dressing on top and mix well. Finally sprinkle the roasted almonds and serve immediately. Next > The Ultimate Brownie Recipe! 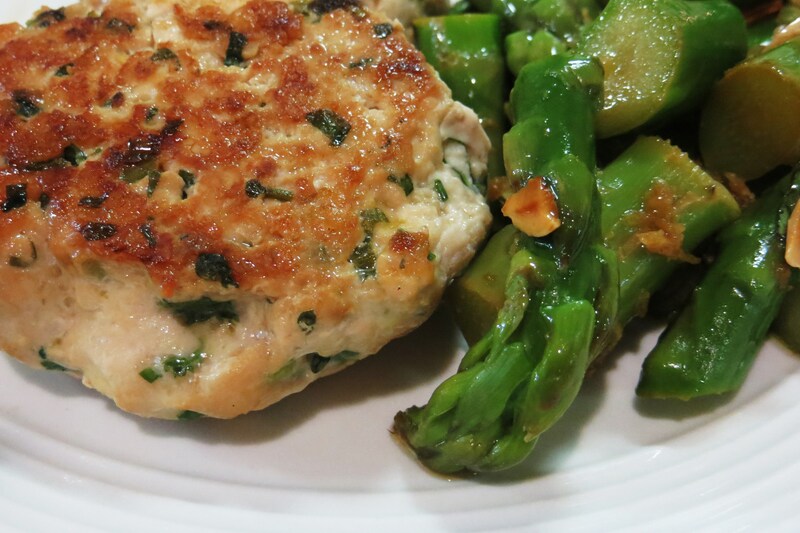 Pingback: Asian Inspired Chicken Burgers and Asparagus | The LCHF Club! Just trying out this reblogging function! can you please provide nutrition for this recipe. Hi Adymek – thank you for stopping by. Unfortunately I don’t know the nutrition amounts for any of my recipes. I’m not a nutritionist and cook for the love of it. However I am certain you will be able to figure it out. If you make this – I hope you enjoy it!